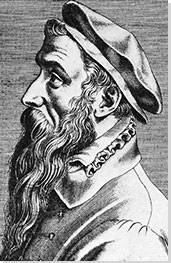 The below artworks are the most important by Pieter Bruegel the Elder - that both overview the major creative periods, and highlight the greatest achievements by the artist. 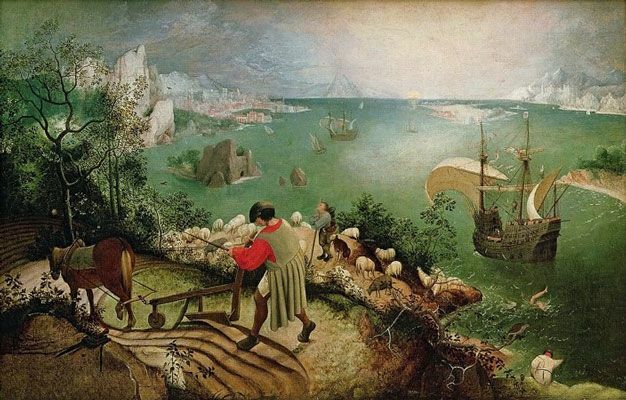 Artwork description & Analysis: One of Bruegel's best-known paintings, Landscape with the Fall of Icarus incorporates a landscape in the foreground with an expansive seascape stretching away towards the horizon. Closest to us, a farmer pushes a plow and horse. To his right, on a lower plateau of land, a shepherd tends to his flock. In the right foreground, a fisherman with his back to the viewer casts his net at the water's edge, while close to the shore in the bottom-right, two legs kick in the air: a comically minute reference to the titular narrative, which therefore seems to unfold in the background of the scene. 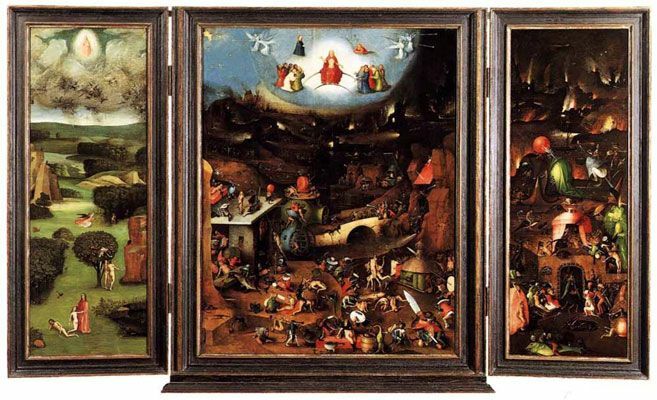 Artwork description & Analysis: In one of his more lurid and chaotic paintings, Bruegel offers us a dense allegorical representation of the competing drives underpinning human character by showing the customs associated with two festivals closely aligned in the early-modern calendar. To the left, the figure of the Carnival holds sway: a fat man astride a beer barrel with a pork chop pinned to its front, spit-roasting a pig and wearing a meat pie as a helmet. 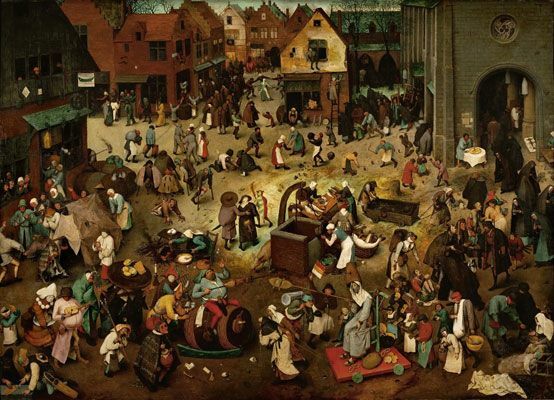 He presides over a scene populated by jesters, revelers, musicians, thieves, and beggars. To the right, the gaunt figure of Lent, in the habit of a nun, extends a platter of fish, in defiance of his richer offerings. Behind her, hooded figures emerge from the archway of a church, in which the artworks are shrouded in the custom of the season of abstinence. To the other side of the canvas, the tavern provides an equivalent backdrop, standing for the sins and pleasures of the flesh. 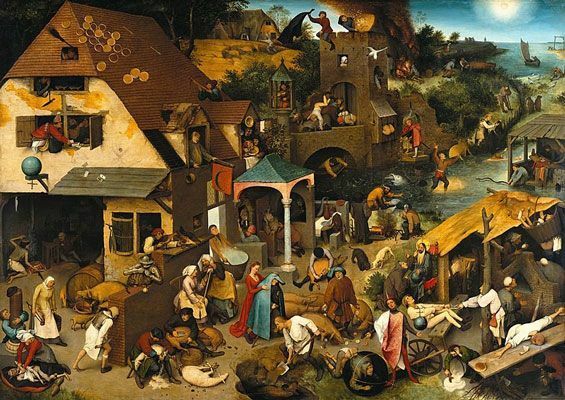 Artwork description & Analysis: This painting shows Bruegel's mastery of complex composition, often based on strong diagonal lines bringing overall cohesion to a large number of intersecting focal points. In The Netherlandish Proverbs, a village setting is chosen as the location for a variety of eccentric and superstitious rituals. 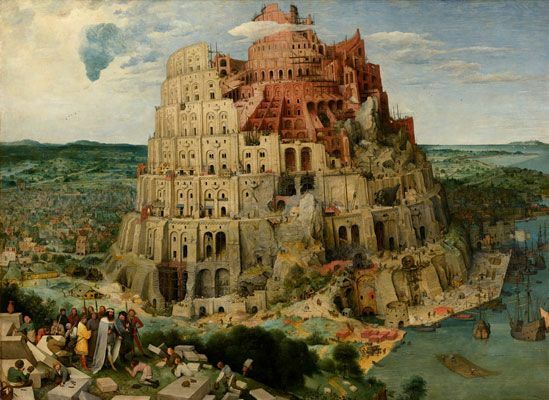 Artwork description & Analysis: A vast, partially constructed tower dominates Bruegel's extraordinary 1563 work The Tower of Babel. Surrounding the structure is a landscape dotted with tiny figures, some of whom march in procession around its curving stories, while others toil at the scaffolds along its sides. To the right, ships unload building materials; in every respect of detail, the painting is minutely, naturalistically accurate. Artwork description & Analysis: In a snow-covered landscape, three hunters lead their dogs through a picturesque, sprawling village. Vivid silhouettes of winter trees dominate the left-hand side of the composition, and, along with the direction of the hunters' movement, lead the eye towards the busy scene at the center, a happy gathering of people on a frozen river. In the background, buildings and snow-covered mountains recede into the distance beneath a blue-gray winter sky. 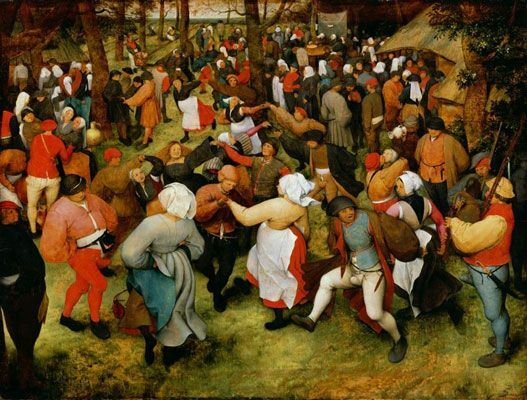 Artwork description & Analysis: Bruegel's life-affirming scene of peasant matrimony is crowded with happy, inebriated revelers. In the background, a table is set with food, while the wedding guests dance, drink, and kiss, forming an unruly circle which fills the central space of the composition. One figure to the right, standing in front of a tree in a black hat and orange shawl, seems detached from the scene even while integrated into the joyful spiral, his demeanor of quiet reflection leading some critics to posit that this is a self-portrait of the artist himself. 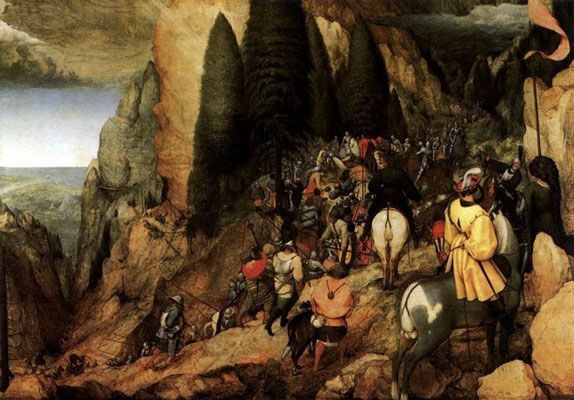 Artwork description & Analysis: A mountainous forest landscape dominates Bruegel's painting The Conversion of Paul. Moving in a diagonal sweep from the center foreground to the right background, a crowd of people, including a number of soldiers in armor, swarm into a gap in the rockface. In the left background, behind the crest of the mountain, a calm body of water stretches away. 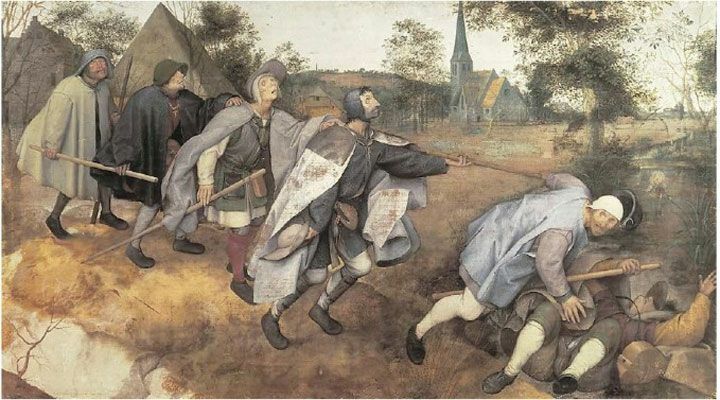 Artwork description & Analysis: Five blind men trudge across the center of this canvas, canes in hand, arms stretched out hopelessly for guidance. The first member of the procession has already tumbled over, and lies on his back in the dirt. 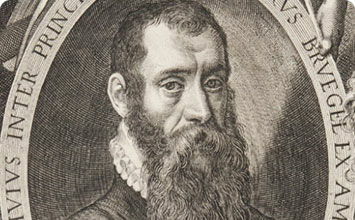 The man directly behind him is mid-stumble, while the steep downward curve of the path behind him suggests that the four following him will suffer the same fate. 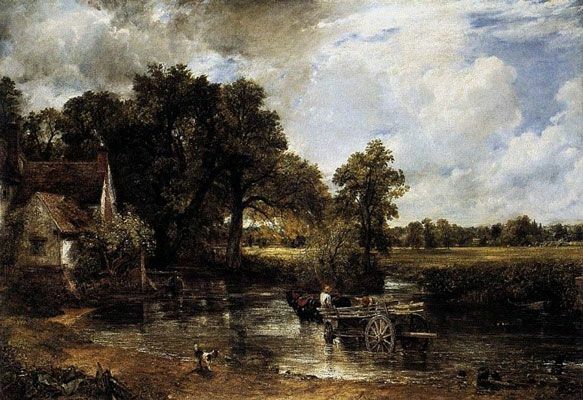 In the background, various features of a typical Bruegel landscape are visible: a church steeple, low thatched roofs, and a curving, tree-lined hillside. 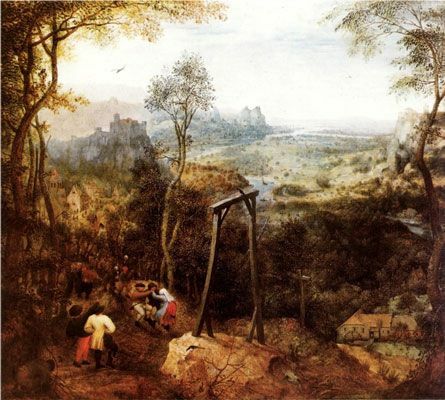 Artwork description & Analysis: A lush woodland landscape dominates this work from the penultimate year of Bruegel's life. 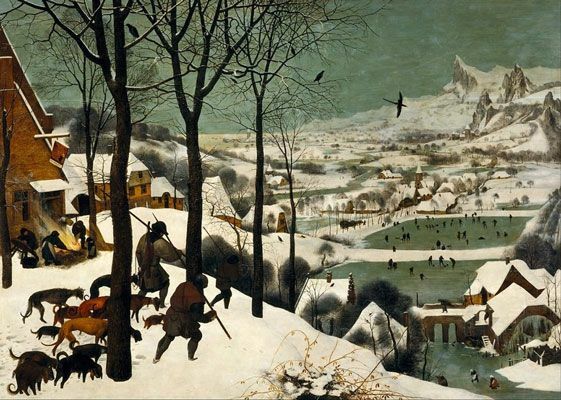 In the background are the gables and tiled roofs of a Netherlandish village, while in the foreground to the left, a group of young peasants plays in the fields, unmoved by the structure to their right, on which a lone magpie perches.